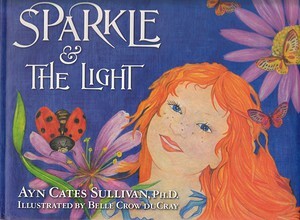 by Ayn Cates Sullivan, Ph.D.
Sparkle & The Light, the second book in the internationally award-winning Sparkle series, brings back the lovable character of Sparkle, with two new delightful stories for children and adults alike. These positive tales and uplifting messages are intended as a celebration for the soul. Sparkle & The Light invites us to find well-being within our own true nature. The second story within the book addresses the issue of bullying and offers insight on how to live from a place of truth regardless of the views of others. The uplifting characters remind us that we are all unique and that we must never be afraid of sharing our light with the world.